Measuring Vertical Blinds - BlindsOnLine.com Inc.
2) Determine whether your verticals will be mounted inside or outside of the window frame. 5) Know if you want a split stack or one way stack. 6) Review the samples before placing your order. 8) When in doubt call customer service. Inside Mount (figure A): For windows with 3” or more of depth an inside mount is possible. For blinds ordered with a standard valance a minimum of 5” of depth is required if valance is to be mounted flush to surrounding walls. A 2” valance return (side piece) will be supplied for mounting blinds whose depth is at least 3” but less than 5”. It is our recommendation to utilize this valance return on all inside mount vertical blinds. Valance returns can be cut to exact size requirements with a sharp scissor once valance has been mounted to the top of the window frame. If window depth is less than 3” deep an outside mount is required. Vertical blind louvers will not rotate fully unless window depth is at least 3” deep. Height- Measure the inside height in 3 places left, center and right. Supply us with the shortest of these three measurements rounded down to the nearest 1/8”. Factory will make a deduction of ½” for bottom clearance. Inside Mount Valance- An optional standard (square corner) or round corner valance may be ordered for inside mounted vertical blinds. The valance will match the vertical blind pattern chosen with your order. Note: patterns that run vertically will show up as a horizontal pattern on vertical blind valances. Round corner valances will come standard with a 2” return (side piece) pre-installed. Round corner valances should not be ordered if the desired look is for the valance to be mounted flush to surrounding walls. Standard (square corner) valances will come with a 2” return that must be installed and cut to size once valance has been mounted. The standard (square corner) valance should be ordered if you are unsure of the final mounting position of your valance; it can be used for all applications. 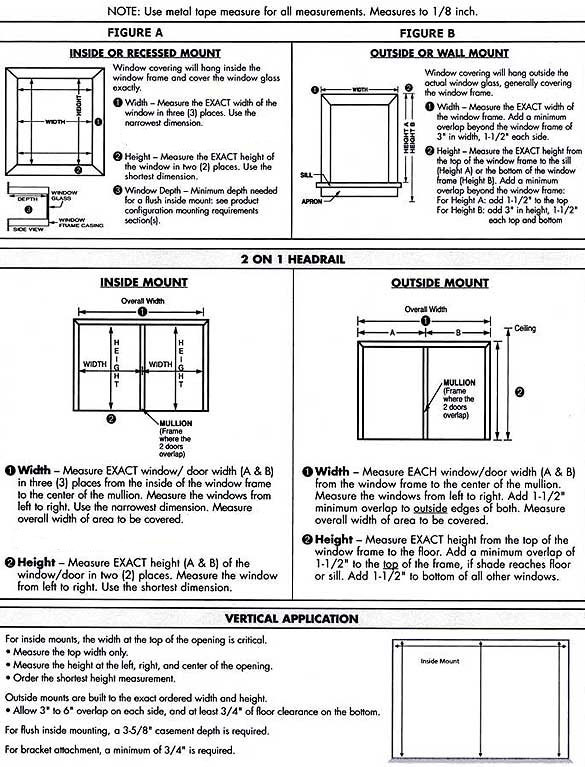 Outside Mount (Figure B): For windows with less than 3” of depth an outside mount is required. Outside Mount Width- Vertical blind track will be cut to the exact width measurement supplied. Outside mount valances will be cut 1 ½” wider than ordered width to fit comfortably around vertical track. Outside Mount Height- The height of an outside mount vertical blind is from the top of the track to the bottom of the vertical louvers. Vertical louvers will be cut 1 ½” less than supplied height to accommodate for the height of the vertical blind track. Do not supply the height of existing vertical louvers or your blinds will be 1 ½” to short. Please follow the directions that follow very carefully. Width- Always use a steel measuring tape. Measure the width of the surrounding molding and add 6”. This will allow for a 3” overlap past the molding on each side. For windows that do not have molding measure the inside width of the window and add a minimum of 8”. This overlap is required for privacy and light blockage. If blinds are to be mounted next to a wall or any other obstruction adjust overlap accordingly, so that blinds do not interfere with the obstruction. For blinds that need to clear an obstruction greater than 2” (such as window cranks or window sills) extension brackets will be required. Please specify at time of order is extension brackets are required as they will not be sent with every order. Height- Measure the height from the top of the window molding to where you would like the vertical louvers to end and add 1 ½” to this measurement. The 1 ½” addition will allow you to mount your vertical blinds just above the top window molding. It is not recommended to mount any vertical blind directly to window molding unless absolutely necessary. Typically this measurement should end either at the window sill or just below the bottom molding, it is your choice. For blinds ending at the window sill you may need to raise mounting brackets 3/8” to ½” above top molding to prohibit vertical louvers from rubbing on the window sill. For blinds measured to the floor you may deduct ¾” of an inch from you measurement for bottom clearance. Factory height specifications require all height measurements to be from the top of the vertical blind track to the bottom of the vertical louvers. Louver size will be 1 ½” less than ordered height. Please do not supply us with vertical louver sizes from any existing vertical blinds. Outside Mount Standard (square corner) Valance- An optional standard valance may be ordered with your vertical blind. Standard valances will measure approximately 1 ½” wider than ordered width in order to fit neatly around the vertical blind track. A matching 3 ½” louver will be inserted into the valance. It is important to note that all patterns that run vertically will be horizontal once inserted into the valance. 8” Valance returns (side pieces) will be supplied with all standard valances and may be cut to size upon installation of the valance. Deluxe Round Corner Valance- An optional round corner valance may be ordered with your vertical blind. Round corner valances will measure approximately 1 ½” wider than ordered width in order to fit neatly around the vertical blind track. A matching 3 ½” louver will be inserted into the valance. It is important to note that all patterns that run vertically will be horizontal once inserted into the valance. Valance returns (side pieces) will be pre installed on all deluxe round corner valances. For blinds that require additional projection to clear obstructions (such as window sills or window cranks) special return lengths may be required. Valance returns are not adjustable on round corner valances.